Sirius Black (1959 – 18 June, 1996), also known as Padfoot or Snuffles in his Animagus form, was a pure-blood wizard, the older son of Orion and Walburga Black, as well as the older brother of Regulus by slightly over a year. Although he was the heir of the House of Black, Sirius disagreed with his family's belief in blood purity and defied tradition when he was sorted into Gryffindor instead of Slytherin at Hogwarts School of Witchcraft and Wizardry, which he attended from 1971 to 1978. As Sirius' relationship with his relatives deteriorated, he gained lifelong friendship in James Potter, Remus Lupin, and Peter Pettigrew. The four friends, also known as the Marauders, joined the Order of the Phoenix to fight against Lord Voldemort and his Death Eaters during the First Wizarding War. Sirius also became the godfather of Harry Potter, the only son of James and Lily Potter. When Pettigrew betrayed the Potters to Voldemort, Sirius sought to exact revenge on Pettigrew. However, Pettigrew was able to frame Sirius for his betrayal of the Potters, the murder of twelve Muggles, and the staged murder of Pettigrew before Sirius could accomplish this. Sirius was sent to Azkaban, and after twelve years became the only known person to escape the prison unassisted by transforming into his Animagus form of a massive black dog confused with a "Grim." Sirius exposed Pettigrew's treachery to his old friend Remus and his godson. After Lord Voldemort returned in 1995, Sirius rejoined the Order. He was murdered by his cousin Bellatrix Lestrange during the Battle of the Department of Mysteries and subsequently cleared of all charges by the Ministry of Magic. He briefly appeared again through the Resurrection Stone on the 2 May, 1998 for Harry, along with James Potter, Lily Potter, and Remus Lupin. Harry later named his first son James Sirius Potter after him. Harry: "Were — were your parents Death Eaters as well?" Sirius: "No, no, but believe me, they thought Voldemort had the right idea, they were all for the purification of the wizarding race, getting rid of Muggle-borns and having pure-bloods in charge." Sirius was the last remaining heir (resident) of the House of Black, a once-notable pure-blood wizarding family. His parents, Orion and Walburga, were both Blacks by birth and second cousins. Sirius had a younger brother, Regulus, who died after turning against Lord Voldemort in 1979 by attempting to destroy his Horcruxes. He was killed by the Inferi guarding one of his Horcruxes (although Sirius did not know this). Sirius did not share a close relationship with his brother, calling him "a better son" than himself. "Sirius" is a traditional Black family name, recurring in at least three generations and following a family tradition of naming children after stars, constellations, and galaxies. The names Cygnus, Arcturus, and Regulus have also occurred at least twice each. Notably, however, only one Sirius (the subject's great-grandfather) left a line of descent, which ended with the youngest Sirius. The Black family believed strongly in pure-blood elitism. They refused to consort with Muggles or Muggle-borns, Squibs and blood traitors and even disowned Squib family members, such as Sirius' great-uncle Marius Black, and insisted that their family members only marry within respectable pure-blood classes; because of these beliefs, they were forced to marry their own cousins. They also held the Dark Arts in reverence. Sirius rejected these values, leading to conflict with his family. He even put permanent-sticking charms on Gryffindor banners, as well as pictures of Muggle girls in bikinis, and motorcycles, and a picture of himself and his Gryffindor friends on the walls of his room to emphasise his differences from the family and annoy his parents. When his cousins Bellatrix and Narcissa made the desirable pure-blood marriages, to Rodolphus Lestrange and Lucius Malfoy respectively, Sirius held them in contempt. His favourite cousin, Andromeda, was disowned by the family as a "blood traitor" when she married Ted Tonks, a Muggle-born wizard. Sirius would later share this designation and was held in contempt, even hatred, by some members of his family. However, in his later life, Sirius established friendships with his first cousin once removed, Nymphadora Tonks, as well as his godson Harry (whom he loved as a son), Harry's friends Hermione and Ron, (his third cousin) and his distant cousins in the Weasley family. He was distantly related to Arthur. Sirius had an unhappy childhood; by adolescence he had come to hate most of his relatives, in particular his mother, Walburga and his cousin Bellatrix Black. Whereas all other members of the Black family were sorted into Slytherin, Sirius was placed in Gryffindor during his sorting in 1971, showing that his views had already diverged from those of the rest of the family before he came to school. Sirius also took great care in hanging Gryffindor banners all over his room at Number 12 Grimmauld Place to show his difference from the rest of the family. He also had several pictures of Muggle girls in bikinis, which outraged his mother. By contrast, he greatly enjoyed life at Hogwarts, where he was inseparable from his best friends James Potter, Remus John Lupin and Peter Pettigrew. Remus, they later discovered, was a werewolf. To support him, Sirius, James and Peter secretly — and illegally — became Animagi, which allowed them to safely accompany Remus during his transformations and keep him under control. Sirius' form took the shape of a huge black dog (not unlike the Grim), from which his nickname "Padfoot" was derived, James would become a stag (Prongs), and Peter would become a rat (Wormtail). The four friends called themselves "the Marauders" and used the nicknames "Moony, Wormtail, Padfoot, and Prongs," Padfoot, Prongs, and Wormtail after their three Animagus forms and Moony after his lycanthropic condition. They would, during their time at Hogwarts, create the Marauders Map which allowed them to see where everyone in the castle was at a given time which made sneaking around and avoiding teachers much easier. Although he later considered himself "an idiot" during this time, Sirius, along with James, was immensely popular: teachers respected his intelligence, though not his behaviour, and girls adored his dark handsome looks, but his especially rebellious attitude made him ignore them, therefore making the girls fawn over his bad boy attitude. Many teachers regarded him and James as troublemakers or practical jokers; Hagrid once compared them to the mischievous twins Fred and George Weasley. Sirius' popularity was not universal, however. Early on, a mutual hatred sprang up between James Potter and Severus Snape. Sirius actively supported James, leading to Snape bestowing an equal and life-long grudge upon Sirius, which resulted in Snape's happiness after Sirius's death. Sirius later claimed Snape was "this little oddball who was up to his eyes in the Dark Arts" from Snape's first moments at Hogwarts, though there is no evidence of this during their first meeting. It could be that Sirius was exaggerating this to demonise Snape. Sirius and James often went out of their way to bully Snape; while watching one of Snape’s memories in the Pensieve, Harry saw Sirius and James physically bully him simply out of boredom. Sirius attempted to justify this by pointing out that he and James were only 15 at the time (to which Harry hotly replied, "I'm 15! "), though he did admit that he and James were "arrogant little berks", and that he was not proud of his behaviour. He and James eventually ended their campaign of ill treatment towards Snape, but they apparently never apologised. Early in his Hogwarts career, Sirius played a potentially lethal practical joke on Snape. He informed Snape of how to enter a tunnel under the Whomping Willow that would lead to the Shrieking Shack where, unknown to Snape, Remus Lupin was confined during his transformations into a werewolf. Snape went there during a full moon, and James was forced to rescue him. Sirius excused his own actions, explaining that he had simply told Snape what he wanted to know about the tunnel, while omitting crucial information. He simultaneously claimed it "served Snape right." The resentment Snape felt for Sirius was never healed. Snape was not the only student that Sirius, and James, tormented during their years at Hogwarts. They also used an illegal hex on a boy named Bertram Aubrey which caused his head to grow twice its original size. It is unknown why they hexed him. At age sixteen, Sirius finally broke away from his family and took refuge with James Potter and his parents. The Potters genorously adopted Sirius as a son. His outraged mother blasted his name off the family tree, as was tradition for those who did not support the family's supremacist ideology. Sirius’ uncle Alphard, Walburga's brother, sympathised with his young nephew and left him a large inheritance, most likely causing Walburga to blast Alphard's name off as well. Sirius was left financially independent by his uncle’s generous bequest. Sirius: "What was there to be gained by fighting the most evil wizard that ever existed? Only innocent lives, Peter!" Peter: "You don’t understand! He would have killed me, Sirius!" Sirius: "THEN YOU SHOULD HAVE DIED! DIED RATHER THAN BETRAY YOUR FRIENDS, AS WE WOULD HAVE DONE FOR YOU!" After leaving school, Sirius fought against Lord Voldemort, eventually joining the Order of the Phoenix. Around 1977, he and James were involved in a motorbike chase with two policemen. Although the chase started off as a bit of fun, it turned slightly more serious when the pair were attacked by three men on broomsticks. Sirius and James used their wands to raise the police car that had been chasing them, and their attackers crashed into it. Sometime in 1979, Sirius's father and brother both died. Orion's death was from an unknown cause, while Regulus's death was when he drank the Drink of Despair, and when he tried to get water to quench his thirst, he was dragged to his death by the Inferi. He remained the best of friends with James, and attended James' wedding to Lily Evans as best man. When their son Harry was born, James and Lily named Sirius godfather, thus designating him as Harry's guardian in the event of their deaths. He also gave Harry his first broom at the age of one as a birthday present, as stated by Lily in a letter found by Harry a number of years later. After joining the Order of the Phoenix, Sirius found himself roiling with mistrust and stress due to the great terror that was Lord Voldemort. It took its toll — by October 1981, he no longer trusted his old friend Remus Lupin, suspecting he was a spy and excluding him from important information. However, he trusted Peter Pettigrew implicitly, a decision he would grow to regret for the rest of his life. In 1981, the Potters were aware that Harry, along with the son of fellow Order members Alice and Frank Longbottom, had become Lord Voldemort's specific targets. Albus Dumbledore advised the Potters to go into hiding using the Fidelius Charm, which Dumbledore hoped would conceal them from doom. James was adamant about Sirius being their Secret-Keeper, believing that Sirius would willingly die rather than reveal where they were. However, believing Voldemort would suspect him, Sirius suggested a "weak, talentless thing" — Peter Pettigrew — as a less obvious choice. Keeping everyone else, including Remus Lupin and Albus Dumbledore, in the dark, Sirius and the Potters reassigned Pettigrew to be Secret-Keeper with Sirius as a decoy. On Hallowe'en night 1981, Sirius went to Pettigrew’s hiding place and found him missing. Unsettled by the lack of signs of a struggle, Sirius frantically sped to Godric's Hollow, discovering the Potters' house destroyed and his friends dead; only baby Harry was still alive. When Rubeus Hagrid appeared on the scene to rescue Harry, on Dumbledore's orders, Sirius offered to take Harry himself. However, Hagrid told him that Dumbledore had made arrangements to send Harry to Lily's sister, Petunia. Sirius conceded, and gave Hagrid his flying motorcycle, telling him he wouldn't need it; nevertheless, after Hagrid had handed over the baby, he intended to return Black his bike. After leaving Godric's Hollow, Sirius, overcome with grief and rage, tracked Pettigrew down, determined to kill him in vengeance. However, Pettigrew outwitted Black: confronted by Sirius on a city street, he shouted out that it was Sirius who betrayed the Potters, and then created a huge explosion which enabled him to fake his own death, leaving a severed finger behind as evidence, and killed twelve Muggles in the process. Fudge claimed that he saw Black laughing maniacally at the scene of the crime, suggesting that Peter's escape nearly pushed him over the edge into insanity. Sirius was arrested by the Department of Magical Law Enforcement and was sentenced without trial to Azkaban for the murder of Pettigrew and the twelve Muggles, for giving the information about the Potters' whereabouts which lead to their death and for being in the service of Lord Voldemort. He would spend the next twelve years in solitary confinement at the mercy of the Azkaban guards, the Dementors. Driven to the brink of madness, he retained his sanity by focusing on his innocence. He said, in the Shrieking Shack, that "it was more an obsession than a happy thought"; it could not be detected by the Dementors, but still gave him small comfort. However, his brooding over his friends' deaths and Pettigrew's betrayal became an obsession as well. In 1985, Sirius's mother died, leaving the Black house-elf Kreacher alone in the house and the house was left abandoned. In 1993, Sirius became the first known person to ever escape from the wizard prison of Azkaban. After several trying years in Azkaban, he regained enough strength to transform into his Animagus form. Since Dementors have difficulty sensing the less complex emotions of animals, he was able to remain relatively unaffected as a dog. After receiving an issue of the Daily Prophet from Cornelius Fudge during an inspection, Sirius discovered that Pettigrew was still alive and in hiding in his Animagus form as Ron Weasley's pet rat. Filled with the desire for revenge, Sirius took his Animagus form and, thinned from malnourishment, was able to slip through the bars of his cell and past the Dementors. He swam across the North Sea to freedom, though the journey nearly killed him. He made his way to Little Whinging to catch a glimpse of his godson as a teenager, where his appearance startled Harry before the Knight Bus turned up. As news of Sirius muttering "he's at Hogwarts" in his sleep, and subsequently escaping, was released, the Wizarding community went on high alert, believing that he planned to murder Harry in a mad attempt to bring Lord Voldemort back. Sirius took refuge around Hogsmeade and the Forbidden Forest, where he was spotted a few times and mistaken for the Grim. He made the acquaintance of Hermione Granger's cat Crookshanks, who had recognised that Sirius wasn't actually a dog, and who had also recognised Peter for what he was. Crookshanks attempted to bring Peter to Sirius, but Ron was very protective of his so-called pet. Half-crazed and desperate, Sirius sneaked into Hogwarts through the old passageway from the Shrieking Shack and on one occasion slashed the Fat Lady's portrait when she refused him entrance to Gryffindor Tower. Later, he came to view the Quidditch match between Gryffindor and Hufflepuff, where he witnessed Harry's excellent flying skills, which mirrored James'. Eventually, he was able to enter the Gryffindor common room with a list of passwords Crookshanks had stolen from Neville Longbottom and shredded Ron’s bed curtains in his search for "Scabbers." Peter was nowhere to be found since Sirius's escape had prompted him to once again fake his own death and hide. In June, Sirius caught Ron carrying Scabbers, after the rat had been discovered hiding in Rubeus Hagrid's cabin, and dragged both boy and rat through the tunnel under the Whomping Willow to the Shrieking Shack. Harry and Hermione Granger followed, the former intent on confronting Sirius about the supposed betrayal of his parents, despite the obvious differences in their ages and skill levels; Sirius' weakened state (due to being on the run) at that time led to the boy easily, and wandlessly, overpowering the older wizard despite Crookshanks's attempts to aid the Animagus. Once Harry had Sirius at his mercy, Remus Lupin, who had seen Peter on the confiscated Marauder's Map, disarmed Harry and warmly greeted his old friend. Together, Lupin and Sirius revealed Peter's true form. Both wanted to kill their former friend for betraying James and Lily, but Harry prevented them from doing so, believing that it would be better to force Pettigrew to face justice at the hands of the Dementors. That, and he didn't want his father's friends to be murderers. As they made their way back to the castle, Sirius hesitantly asked Harry if he would like to live with him, thinking Harry would not want to live with the aunt and uncle who had raised him; Harry enthusiastically agreed, thrilled at the idea of leaving the Dursleys and finally having a real home. Unfortunately, soon after they left the Whomping Willow, Lupin transformed under the full moon and, having forgotten to take the Wolfsbane Potion in the wake of discovering Pettigrew, was uncontrollable. In order to protect Harry, Ron, and Hermione from Lupin, Sirius turned back into a dog, giving Pettigrew an opening to escape and flee. Sirius was weakened following his encounter with Lupin's werewolf form and could not protect himself when the Dementors guarding Hogwarts arrived. Harry, who had followed Sirius and found him lying unconscious and surrounded by the hooded creatures, attempted to perform the Patronus Charm but to no avail. The Dementors nearly succeeded in sucking out Sirius' soul until a powerful Patronus resembling a stag warded them off. Sirius was briefly re-captured by Snape, and was sentenced to the Dementor's Kiss, a fate worse than death. Miraculously, and by Albus Dumbledore's suggestion, Harry and Hermione used Hermione's Time-Turner to help Sirius escape; as Dumbledore had also hinted that "more than one innocent life" could be saved that night, they rescued the hippogriff Buckbeak from execution, thus granting Sirius a form of travel. Sirius was once again a wanted man, although alive and with his soul intact. Soon after his escape, he sent Harry, Ron and Hermione a letter via a tiny, hyperactive owl, explaining that it was he who sent Harry the Firebolt for Christmas, and giving Harry permission, as his godfather, to go to Hogsmeade. He also apologised to Ron for the loss of his pet, asking him to accept the owl in "Scabbers" place. Sirius fled Europe beyond the Ministry of Magic's jurisdiction. He communicated with Harry (using brightly coloured tropical birds, much to Hedwig's annoyance) very seldom to retain the secrecy of his location. Harry grew to greatly rely on Sirius' advice in time of need. Sirius returned to Britain when Harry gave him notice that his scar had been hurting, which had come to be known as a signal of Lord Voldemort’s presence or power. When Harry was mysteriously entered in the Triwizard Tournament, Sirius hid in a cave near Hogsmeade and provided mostly moral support to Harry during this time. He warned Harry about Igor Karkaroff, the Durmstrang headmaster, telling Harry that Karkaroff used to be a Death Eater and that he gave up a considerable number of names in exchange for his freedom. Harry told Sirius about seeing the name "Bartemius Crouch" appear on the Marauder's Map when he was working on the second clue. Sirius admitted that it was fishy, but told Harry to focus on the task at hand and leave the mystery surrounding Crouch's "illness" to others. When Barty Crouch mysteriously disappeared in the castle grounds, Sirius warned Harry that someone didn't want Crouch to get to Dumbledore. He advised Harry to continue his practise of defensive spells, and to never wander off on his own. With Lord Voldemort restored to his physical form, Dumbledore reinstated the Order of the Phoenix, sending Sirius to gather the old crowd and inform them of the situation. Sirius donated his family home at 12 Grimmauld Place in London as Order Headquarters. Unfortunately, as he was still wanted by the authorities, Sirius could never safely leave the house and became quite bitter over his perceived "uselessness". When he briefly left the house to see Harry to the Hogwarts Express, Draco Malfoy nastily complimented Harry on his "pet dog," which, coupled with comments Malfoy made on the train, suggested Sirius' cover was blown. Harry and Sirius stayed in touch during Harry's school year via owls and the Floo Network, though Sirius' presence was nearly discovered by Dolores Umbridge during her dictatorial managing of Hogwarts that year. Sirius acted as more of a brother than father figure to Harry throughout his hardships with Umbridge, encouraging him to oppose her reforms and strongly approving of Harry's secret defensive tutorial group for students, Dumbledore's Army. His vigorous support of Dumbledore's Army worried Hermione, who thought that Sirius was attempting to live vicariously through them. He also willingly answered all of Harry's questions about the Order and Voldemort, though most of Harry's mentors felt Harry was too young to handle the burden of the truth. He also urged Harry to contact him if Professor Snape gave him a hard time during their Occlumency lessons. During his time confined to the Order's headquarters, Sirius began to let himself go. When Harry and the Weasleys arrived at Grimmauld Place just after Arthur was attacked by Nagini, Sirius was unshaven and still in his day clothes late at night. He also seemed to have taken to drinking, as he had a "Mundungus-like whiff of stale drink about him". However, Sirius made a complete turn-around when the Weasley family and Harry decided to stay at Grimmauld Place over the Christmas holidays for its proximity to St. Mungo's, and at one point was heard singing "God Rest Ye, Merry Hippogriffs" at the top of his lungs. Voldemort used Legilimency to implant a false vision into Harry's mind that Sirius was being tortured in the Department of Mysteries, convincing Harry that Sirius had in fact been captured. After giving Severus Snape a cryptic message informing him of the situation and then ditching Umbridge in the Forbidden Forest, Harry, along with Ron, Hermione and fellow D.A. members Ginny Weasley, Neville Longbottom and Luna Lovegood, flew to London via Thestral. The students made their way through the deserted Ministry of Magic and gained access to the Department of Mysteries, only to be ambushed by Death Eaters. It was Snape who ultimately saved their lives by alerting the Order to what Harry had seen; Sirius, Kingsley Shacklebolt, Nymphadora Tonks, Remus Lupin, Alastor Moody, and eventually Albus Dumbledore, arrived at the Ministry and began battling the Death Eaters. Tragically, however, during a frenzied duel with his hated cousin Bellatrix, Sirius was struck with a spell, causing him to fall through the Veil in the Death Chamber to his death. It would be years before Harry could fully come to terms with the loss of his godfather, who, as Dumbledore flatly stated, was the "closest thing to a parent" Harry had ever known. Harry Potter blamed himself for Sirius's death. Sirius: "Dying? Not at all. Quicker and easier than falling asleep." In the aftermath of Sirius's death, Harry, enraged and grief-stricken, unsuccessfully attempted to take revenge on Bellatrix before Voldemort arrived. After a short duel between Dumbledore and Voldemort, the latter fled, but not before he was seen by Cornelius Fudge himself and several other Ministry officials, finally forcing them to abandon their smear campaign against Dumbledore and Harry and admit the truth to the world. With that done with, Dumbledore successfully convinced the Ministry that Sirius was innocent all along and managed to get him cleared of all charges posthumously. Black did not have a wife or children. As the portrait of Phineas Nigellus, Black's deceased great-great-grandfather, stated, the direct line of the ancient Black family ended with Sirius' death. Had Regulus Black lived, he would have been the heir of the Black home; however, he predeceased Sirius. By right of primogeniture, then, his heir was either Bellatrix Lestrange (his eldest cousin, but legally invalidated by her murder of Sirius), Andromeda Tonks (his second-eldest cousin, who was disowned), or Draco Malfoy, the next senior male of the Black family through his mother, Narcissa Malfoy (née Black). However, their rights were superseded by Black’s will, which designated Harry Potter as heir to all his worldly possessions. Thus, by the will, Harry inherited 12 Grimmauld Place, Buckbeak (later known as Witherwings), Kreacher, and the remaining Black fortune. Having no great love for 12 Grimmauld Place, the house that held so many painful memories for Sirius, Harry chose to give it to the Order of the Phoenix for their continued use as Headquarters. Kreacher, forced to serve Harry by Black's will, was sent to work as a Hogwarts house-elf in the school kitchens (an imposition which did nothing to improve Kreacher's hatred of Harry). Buckbeak passed back into Rubeus Hagrid's care under the assumed name "Witherwings". Black had given Hagrid an enchanted, flying motorbike 16 years prior at Godric's Hollow, after Black discovered the Potters had been killed. After begging Hagrid to give him baby Harry — a request Hagrid refused because he had orders to take young Harry to Little Whinging — Black gave Hagrid the bike before setting off to hunt down Peter Pettigrew. The bike was in Hagrid's possession until it was needed to bring Harry from Number 4 Privet Drive to Order Headquarters shortly before Harry's seventeenth birthday. The bike ended up crashed, as the Order was ambushed by Death Eaters. Ted Tonks collected the debris and sent it to Arthur Weasley, who later repaired the bike and gave it to Harry. Black was one of the four shadows that summoned by the Resurrection Stone to speak to Harry as he went to what he believed to be his death in 1998. Black assured his godson that dying was not painful, and that they would stay with him as he went to confront Lord Voldemort. When Harry reached the fire, the stone slipped from Harry's hand, thus his parents, Sirius, and Lupin vanished. Harry later gave his first son the middle name Sirius to honour his godfather. Sirius was a tall, well-built, darkly handsome man with fair skin, long, lustrous black hair, striking grey eyes, and an air of "casual elegance". This vestige of aristocratic beauty is apparently an attribute passed down through the Black Family. When Harry entered into Snape's memory, he saw a fifteen-year-old Sirius finishing his exams while being ogled by a girl who sat a few rows behind him, due to his considerable good looks and casual yet elegant attitude. Unfortunately, Sirius's handsomeness suffered due to the depression and maltreatment he underwent during the twelve years he spent in Azkaban. When Harry first saw him in the Shrieking Shack in 1994, he had a gaunt, sunken face, waxy skin, yellow teeth, and long, matted hair; Harry thought he looked as a corpse might. By November, after his escape, he visited Harry in the Common Room fireplace, and he was described as having short, clean hair and a fuller, younger face. However, by the next spring, his condition deteriorated, and he reverted back to a state that was only slightly better than that which he had been in a year ago: unshaven, with a faint scent of stale drink around him, and he did not bother to change his clothes at night (presumably a result of his "imprisonment" at the home he utterly despised and his conviction of his apparent uselessness). He was also branded with a series of tattoos over the chest and arms. Death, however, served to restore him to the peak of his dark good looks and vitality — his spirit was described as "tall and handsome, and younger by far than Harry had ever seen him in life. He loped with an easy grace, his hands in his pockets and a grin on his face". Hermione: "You don’t think he has become…sort of…reckless…since he’s been cooped up in Grimmauld Place? You don’t think he’s…kind of…living through us?" Harry: "What d'you mean, 'living through us'?" Hermione: "I mean...well, I think he’d love to be forming secret Defence societies right under the nose of someone from the Ministry... I think he’s really frustrated at how little he can do where he is…so I think he’s keen to kind of…egg us on." Sirius was true to a Gryffindor student's ideals. He was true-hearted and brave, as shown by his participation in both wars and willingness to die for those he loved. In his youth, he was a witty and talented wizard, but also quite an arrogant and mischievous troublemaker, with a bad habit of bullying those he particularly disliked, namely Severus Snape. He could also be vicious towards those he hated, sometimes unjustifiably — deliberately sending the teenage Snape off to the Shrieking Shack while knowing that it was extremely dangerous, if not fatal, for his nemesis to do so. As an adult, Sirius was shown to be capable of an explosive temper when angered, a trait shared by his mother, Walburga Black, and his mad cousin, Bellatrix Lestrange. His years in Azkaban contributed dramatically, which was especially evident during 1993 and 1994: trying persistently to capture Peter Pettigrew, going to lengths that even Dumbledore commented as not those of an innocent right-thinking man. Later on, he occasionally demonstrated himself to be reckless, immature, and even downright irresponsible. In several instances, he risked getting caught by the Ministry because he felt stir-crazy in his house, and advised Harry to take rash actions. Much of this can likely be attributed to the vast amount of time spent in jail, which stunted his emotional development and making him especially eager to spend time with and protect his loved ones. However, through it all, Sirius was ultimately a pure soul. For all his wrath towards Pettigrew, he was capable of respecting Harry's request to not murder the man he escaped Azkaban to kill; opting instead to expose Pettigrew (a plan that unfortunately failed, with catastrophic results). He also seemed to have possessed a superb mental control that contrasted sharply with his passionate and impulsive nature. The fact that he was able to completely resist the psychological effects of the dementors for so many years suggests that he had an unusually strong sense of self, and therefore was capable of withstanding long periods of emotional torture and despair. Besides all this, Sirius seems to have some traits related to his Animagus form of a dog. Such examples are when James Potter points out Snape, and Sirius is described as "perfectly still like a dog smelling a rabbit." The most referenced of these traits is his "bark-like laugh." as it is described nearly every time it is heard. Sirius was described as a powerful wizard by Minerva McGonagall, his former teacher. One of his dearest friends, Remus Lupin, also stated that he had been one of the cleverest Hogwarts students of his time. Animagus: Sirius was able to become an Animagus at the early age of fifteen, assuming the shape of a large black dog, like the Grim. Since he was unregistered, he was able to take advantage of this ability to elude his Ministry captors. Transfiguration: Sirius, along with his friend Remus, could perform human transfiguration on Peter, forcing him out of his Animagus form. Non-verbal magic: Sirius was able to perform human transfiguration and defensive magic such as Disarming and Stunning spells non-verbally. This is a testament to his possessing superior magical ability as non-verbal magic is very difficult. Duelling: In his fifth year, Sirius helped James Potter humiliate Severus Snape, who was an exceptionally talented wizard even in his youth. During the Battle of the Department of Mysteries, Sirius duelled with Lucius Malfoy and Antonin Dolohov and with the help of his godson, Harry, he defeated both of them (disarming and stunning Lucius Malfoy non-verbally). He was also able to hold his own against his cousin, Bellatrix Lestrange, who was Voldemort's most powerful Death Eater, though his recklessness caused his death in her hands. Physical combat skills: Sirius was also known to infuse physical combat into his duelling style, such as when he rammed Dolohov with his shoulder and punched Malfoy in the face. While in his Animagus form, he also held his own against Remus when he was in his werewolf form, and in his school years, he and James primarily used their respective Animagus forms to physically keep Remus under check while he was a werewolf. Healing magic: Sirius was able to cast healing spells — he healed an injury from Wartcap Powder as soon as he received it. Charms: Sirius appeared to have been talented in Charms from a young age, since he and his Marauder friends — James, Remus, and Peter — managed to create the Marauder's Map in their teenage years. This manufacturing process involved the complicated Homonculous Charm and a spell to insult those who attempted to read it, both of which lasted long after all four of the producers' demises. He was also able to cast an effective Shield Charm during the Battle of the Department of Mysteries to protect Harry. He also managed to place a Permanent Sticking Charm upon many of the hangings in his room at Number 12, Grimmauld Place, showing an aptitude for the Charm as his parents were never able to remove said items from the wall. The nature of Sirius's relationship with his family during his early childhood is unknown, but at the age of eleven, he earned the severe disappointment and disapproval of his family by being Sorted into Gryffindor house at Hogwarts. Sirius, in turn, became increasingly rebellious, flaunting his house affiliation and disdain for his family's pure-blood values. His relationships with his mother and cousin Bellatrix became particularly antagonistic; Walburga disowned Sirius when he left home at the age of sixteen, burned his name off the family tree, and even treated her brother, Alphard, to the same punishment simply for leaving money to his nephew. Little is known about Sirius' relationship with his younger brother, Regulus, as he never spoke about it. It was revealed, however, that Sirius had wished that Regulus had not been foolish enough to go with what their parents told him to do, and was rather upset with losing his little brother to the Death Eaters at such a young and promising age. It can be theorised that he would have been comforted if he had known that his brother had died defying Voldemort. Sirius later claimed to have "hated the whole lot of them," referring to his family, aside from his cousin Andromeda, who also rejected the notion of blood purity and married a Muggle-born wizard. After his escape from Azkaban, Sirius became friendly with Andromeda's daughter, Nymphadora Tonks, a fellow member of the Order of the Phoenix. It can also be assumed that he at least had a more healthy relationship with his uncle Alphard than most of his family considering he left some inheritence for Sirius. He was killed by his cousin Bellatrix during the Battle of the Department of Mysteries in a duel, during which both taunted each other; Bellatrix laughed after killing her cousin, overjoyed that she had simultaneously killed a "blood traitor" and caused Harry, her beloved master's most hated enemy, unbearable pain and heartbreak. His other cousin, Narcissa Malfoy, also seemed to hold Sirius in low regard, as she taunted Harry Potter about his death when they argued in 1996. It is unknown how his family reacted when he was arrested and thrown in Azkaban, after the public believed he betrayed the Potters to Lord Voldemort. Kreacher was the house-elf of the Black family for years. Kreacher mimicked the family's pure-blood supremacist values, believing he should only serve pure-blood wizards; as such, he accused Sirius of being a "blood-traitor" and "breaking his mother's heart." Sirius, on his part, did not care at all about Kreacher, as he saw too much of the family he loathed in the utterly unpleasant and bad-natured house-elf, and treated him, in Dumbledore's terms, as "a servant unworthy of much interest or notice". As a result, Kreacher grew to harbour a hatred of Sirius, which ultimately proved fatal when Kreacher was easily convinced to reveal the nature of Harry and Sirius' relationship to Bellatrix Lestrange. Equipped with this highly valuable information, Voldemort and his Death Eaters organised a plan that lured Harry to the Department of Mysteries with the intention of rescuing Sirius, whom Harry believed was being held captive and tortured. Sirius and various other members of the Order of the Phoenix arrived at the Department of Mysteries to rescue Harry, but Sirius was tragically killed in the ensuing battle. Though he became increasingly estranged from his own family, Sirius gained three good friends who were in Gryffindor with him: James Potter, Remus Lupin, and Peter Pettigrew. The group was very popular and loved to play pranks. When they discovered that Remus was a werewolf, instead of ostracising him as many would have, they endeavoured to become Animagi in order to keep him company during his monthly transformations. When Sirius ran away from home at age sixteen, James' family took him in. After graduating from Hogwarts, the group of friends joined the Order of the Phoenix. Sirius was James' best man at his wedding to Lily Evans, and the godfather to their son. At some point during the First Wizarding War, Sirius came to distrust Remus, suspecting that he might be a spy. Thus, he did not reveal to Remus that he decided not to be the Potters' Secret-Keeper when they became targets of Lord Voldemort, instead giving the job to Peter, who was less likely to be suspected of holding the secret. This turned out to be a fatal mistake that Sirius regretted for the rest of his life, as Peter betrayed them all. The tragic deaths of James and Lily was a cruel brutal blow to him, as he would have willingly died for them, and confessed that he desperately missed his best friend everyday. He was sent to Azkaban for Peter's crimes, and Remus initially believed that he was guilty. After he escaped from prison in 1993, he told Remus the truth and, together, they planned to kill Peter for his treachery, though they were stopped by Harry. Afterwards, the two reclaimed their friendship, but it was tragically cut short by Sirius' death two years later. The ending of the three Marauders who had stayed true to their friendship to the very end — James, Sirius, and Remus — was bittersweet: though they all lost their lives to the two wizarding wars, it can be theorised that they were reunited in death, never to be parted again, as seen when Harry summoned the three of them with the Resurrection Stone. However, all respect for Peter was lost, as his betrayal was what led to such a breakdown. Sirius: "I've warned you, Snivellus, I don't care if Dumbledore thinks you've reformed, I know better —"
Snape: "Oh, but why don't you tell him so? Or are you afraid he might not take very seriously the advice of a man who has been hiding inside his mother's house for six months?" Sirius immediately got off on the wrong foot with Severus Snape when they met on the Hogwarts Express in their first year, as did James Potter, who would become Sirius' best friend. Sirius snapped at Snape after he sneered at James' wish to be sorted into Gryffindor house, and the two bestowed the mocking name of "Snivellus" on the Slytherin student. They loathed Snape as an "oddball up to his eyeballs in the Dark Arts." According to Sirius, the other boy was jealous of his and James' popularity, and took to following them around, trying to get them into trouble. Sirius and James outright bullied Snape frequently during their years at Hogwarts, sometimes simply out of boredom. Sirius also played a potentially lethal prank on Snape, telling him how to get into the Shrieking Shack while omitting the fact that a werewolf was on the other side, showing a shockingly callous attitude towards Snape's safety. Sirius and Snape maintained their hatred of each other into adulthood. Snape was very eager to see Sirius receive the Dementor's Kiss, a fate worse than death, after he escaped from Azkaban in 1993, as Snape believed him to be the one that betrayed Lily. Snape's efforts to capture Sirius were thwarted by Harry Potter, Hermione Granger, and Ron Weasley. Later, Snape delighted in taunting Sirius about his "uselessness" to the Order of the Phoenix while he was forced to remain cooped up in 12 Grimmauld Place, and the two needled each other at every opportunity. He also, however, told Harry that he was ashamed of his treatment of Snape in their younger years. Sirius met Lily Evans on the Hogwarts Express, where he and James Potter almost immediately made a bad impression on her by insulting her best friend, Severus Snape. She quickly moved to leave the compartment they were all sharing on the train, with Snape in tow, and literally turned her back on Sirius when she was Sorted with him into Gryffindor House. During their earlier years at Hogwarts, Lily came to believe that Sirius was nothing more than a common, highly arrogant bully, just like his best friend, James, so their relationship was not likely a friendly one. That changed in their later years at Hogwarts, presumably after she had ended her friendship with Snape, and got to know and understand Sirius better. During the First Wizarding War, they both became members of the Order of the Phoenix, and fought in several battles. She also sent a letter to Sirius, which showed that they were still friends, despite the intense distrust and fear spread by the First War. After Lily and James were killed by Lord Voldemort, Sirius was devastated; he attacked their betrayer, Peter Pettigrew, and attempted to kill him. He later told Harry that he cared deeply for James and Lily, and that he would have rather died than betrayed them. Sirius was also godfather to Lily's son, Harry, and they shared a strong bond of friendship, love, and trust. Sirius was Harry Potter's godfather, and acted as a confidant and paternal figure to him. He deeply loved Harry, and was the only person Harry felt comfortable confiding in completely. Harry regarded Sirius as a mixture of father and older brother, and Sirius viewed Harry as exceptionally brave and mature for his age, having experienced as much as many adults have. Sirius felt that Harry should have the right to know difficult truths, and considered him perfectly capable of taking on heavy burdens that many other fully-grown wizards could not. Some of the other Order members, however, criticised Sirius' behaviour towards Harry, claiming that he acted as if Harry were James, rather than the child that he undeniably still was. Sirius shared a good deal of information about the First Wizarding War with Harry, much to the disapproval of Molly Weasley, and supported Harry and his friends' efforts to sabotage Dolores Umbridge's dictatorial rule over Hogwarts in their fifth year. While Harry craved a paternal figure, Sirius wasn't equipped to be one, and more or less treated Harry like his best friend, the way Harry's father was before him. Voldemort lured Harry to the Department of Mysteries in 1996 by planting a vision of Sirius suffering in his mind, knowing that Harry would do whatever it took to save his godfather. Harry was completely devastated by Sirius's death, having lost the closest thing to a parent he had ever known. Harry felt riddled with guilt over the incident but eventually managed to compartmentalise his grief, knowing that Sirius wouldn't have wanted to him to shut himself up. In 1998, Harry used the Resurrection Stone to summon the spirits of Sirius, Remus, and his parents, all four of whom gave him the emotional support he needed to sacrifice himself. He assured his godson that dying was not painful at all, and was actually quicker and easier than falling asleep. Harry later named his first son after both James and Sirius. Sirius first met Ron Weasley in 1994. Ron owned a rat named Scabbers which, unbeknownst to him and the rest of his family, was actually Peter Pettigrew in disguise. With his mind and heart firmly set on murdering Pettigrew for his treacherous betrayal, Sirius snuck into Hogwarts and approached Ron's bed, knife in hand, with the intention of killing the disguised rat. However, Ron awoke, saw Sirius and, frightened out of his wits, screamed, alerting the whole dormitory and forcing Sirius to flee for his life. At the end of his third year, however, Ron learned that Sirius was innocent, and discovered the true identity of his pet. Feeling partly responsible for Ron's loss, Sirius gave him an owl to replace "Scabbers". A year later, Ron, along with Harry and Hermione, provided food for Sirius, who was hiding in a cave outside of Hogsmeade. During the Second Wizarding War, Ron and Sirius grew closer, as they both lived at Sirius' house for several weeks, and eventually became good friends. When Hermione voiced her theory that Sirius was attempting to "live through" her, Ron and Harry, both boys snapped at her angrily in Sirius' defence. Sirius and Ron fought alongside one another during the Battle of the Department of Mysteries, and when Sirius was killed by Bellatrix Lestrange, Ron grieved for him, and grew to share Harry's intense hatred of Bellatrix. Sirius also met Hermione Granger during the 1993-1994 school year, following his escape from Azkaban. Hermione, like the rest of the wizarding world, initially believed that Sirius was the wizard who betrayed James and Lily Potter to Lord Voldemort. However, she learned the truth, and even indirectly helped to clear any doubts of his innocence through her questions. Together with Harry and Ron, she brought him food when he was hiding in a cave near Hogsmeade during the 1994–1995 school year. In 1995, she lived for a few weeks at Sirius' house, along with other members of the Order of the Phoenix. It was then, however, that she started to see "flaws" in Sirius' character. Firstly, she severely disapproved of his indifferent and occasionally cruel treatment of his house-elf, Kreacher, despite the fact that Kreacher initially appeared to be disgusted by her and addressed her as "the Mudblood" (which Hermione often attributed to Kreacher being senile due to his old age.) Secondly, she grew to believe that Sirius could be very selfish when it came to Harry, even voicing her theory that a part of Sirius had actually been hoping for Harry's expulsion from Hogwarts, so that Harry would stay with him at Grimmauld Place instead of going back to school for his fifth year. Last but not least, she thought that Sirius was attempting to live vicariously through her, Harry and Ron, but the two boys became angry and snapped at her when she expressed this belief. Nevertheless, she had a generally good relationship with Sirius, knowing him to be an ultimately good person, and was greatly saddened by his death at the Battle of the Department of Mysteries. Albus Dumbledore was Sirius' Headmaster at Hogwarts. Like the rest of the wizarding world, Dumbledore initially believed it was Sirius who betrayed James and Lily to Voldemort, but was quick to accept Sirius' innocence when he learned the Secret-Keeper had actually been Pettigrew, and helped Hermione and Harry to save Sirius from the Dementor's Kiss, and to escape from his Ministry captors, by means of a Time-Turner and Buckbeak. The two resumed their friendship, and Sirius helped Dumbledore to recall the Order of the Phoenix an hour after Voldemort returned. However, their relationship was soon strained: Dumbledore forced Sirius to stay at 12 Grimmauld Place on account of his being a wanted convict, and because he had a tendency to act rashly, which could lead him to put himself in great danger. Though his intentions were noble, Sirius could not bring himself to appreciate Dumbledore's thoughtfulness, as he utterly despised the home which brought him many bitter, unhappy memories, and the fact that he was to be alone in the house most of the time made it all the more intolerable. Nevertheless, he still trusted Dumbledore enough to confide in him about how Harry felt Voldemort awaking inside him the night that Arthur Weasley was attacked. Dumbledore was devastated when Sirius was killed by Bellatrix, believing that it was mostly his fault, and he later expressed to Harry his belief that Sirius was a brave, clever, and energetic man, who would never be content with sitting at home in hiding while his loved ones were in danger. Sirius' death was also a factor that led to Dumbledore finally revealing to Harry things that had been kept secret from him, mainly about the true power of his mother's sacrificial protection and the prophecy about him and Voldemort. Sirius had a close relationship with most of the Weasley family, and was so thrilled to have their company during the Christmas of 1995 that he was heard singing "God Rest Ye, Merry Hippogriffs" at the top of his lungs. However, Sirius disapproved of Molly's overprotective behaviour towards Harry, who had proven time after time that, despite his age, he was brave and matured far beyond his years. Molly, in turn, thought Sirius was wrong to treat Harry like an adult, and that he treated Harry as though he were James. He was also a good friend of Arthur, who was given Sirius' motorbike after the latter's death, and Ginny, at one point, stated that she cared about Sirius as much as Harry did. Fred and George Weasley liked Sirius, and they all joked together; Rubeus Hagrid once compared Sirius and James to Fred and George. A rare bump in Sirius' relationship with the twins occurred shortly after Arthur was wounded by Nagini, and Sirius forbade the Weasley children from visiting their father before it was safe to do so. At this, Fred and George argued, forcing Sirius to remind them of the importance of maintaining the Order's security, at which point Fred yelled back that Sirius, trapped in Grimmauld Place by his fugitive status, was doing virtually nothing for the Order himself. Although he was angered by Fred's words (he even seemed to Harry like he would have liked to hit Fred), Sirius let the slight go, and their relationship recovered shortly after. Sirius' relationship with Bill, Charlie, and Percy is unknown; Sirius met Bill during the time of the Second War when the Weasley family were often at Grimmauld Place with the rest of the Order, but whether he met Percy or Charlie was unknown. Given that Charlie was on his family's side and Percy on the Ministry's, however, it's likely that Sirius would have been friends with Charlie, if he met him, but not Percy; though, considering Percy was practically Sirius' polar opposite, he arguably wouldn't have been particularly close to him in any case. Ginny eventually named her eldest son after her father-in-law and Sirius. When Sirius attended Hogwarts School of Witchcraft and Wizardry, the professors were very fond of him, knowing him to be a witty and charming wizard with a good heart. Their affection, however, did not blind them to the fact that he was also a mischievous trouble-maker and prankster, and did not prevent them from punishing him or his best friend, James, when they went too far with their pranks or caused too much trouble. Minerva McGonagall was Sirius' Head of House during his years at Hogwarts. She described him as a powerful wizard, but she believed it was he who betrayed James and Lily to Voldemort. She learned the truth in 1995, and it's possible that she and Sirius had a good relationship until his death. It is unknown how she reacted when she learned about his death. Horace Slughorn, the Head of Slytherin House, mentioned that he would have liked to have Sirius in his house, having had all of his family. Sirius had a good relationship with most members of the Order of the Phoenix, and it was he who set out to alert them all when Dumbledore reinstated the Order upon Voldemort's return in 1995. Several of the Order members fought alongside Sirius at the Battle of the Department of Mysteries, and when Sirius was killed by Bellatrix Lestrange, Kingsley Shacklebolt continued his duel with Bellatrix. Sirius had been fairly close with Rubeus Hagrid prior to the Death of the Potters, both having been members of the First Order, and most likely having fought together in several battles of the First Wizarding War. Although Hagrid initially believed that Sirius was a traitor, he understood the real situation after it was explained to him, and it is likely that they resumed their friendship. Though Sirius also appeared to be friendly with Mundungus Fletcher, that did not stop Fletcher from stealing Sirius' possessions after his death. The name "Sirius Black" is a pun on his Animagus form of a black dog since the star Sirius is known as the Dog Star and is the brightest star in Canis Major, the Great Dog constellation. Sirius is derived from the Ancient Greek Σείριος, Seirios, meaning "glowing" or "scorcher." In Greek mythology, it is Orion's dog. In Arabic, the star is known as al-shira, "the leader," and in Scandinavia, it has been referred to as Lokabrenna, meaning "Loki's torch." Loki was a trickster god in Norse mythology, a possible allusion to Sirius' days of mischief-making as one of the Marauders. Padfoot refers to a spectral Hellhound with glowing red eyes that haunts the moors around Leeds, in Northern England. Its presence is announced by soft, padding footfalls that may be accompanied by the rattle of chains or a fierce roaring as the beast draws closer to its intended victim. It's one of many "black dog" myths and is the likely source for Sirius' nickname. Black hounds also appear on the Black family crest. 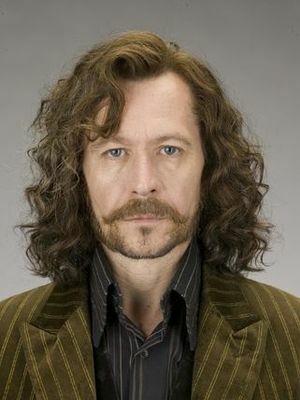 Sirius is portrayed by British actor Gary Oldman in the film adaptations of Harry Potter and the Prisoner of Azkaban, Goblet of Fire, Order of the Phoenix and Deathly Hallows: Part 2. The fifteen-year old Sirius in the film version of Harry Potter and the Order of the Phoenix is portrayed by James Walters. Young Sirius is portrayed by Rohan Gotobed in a flashback in the Harry Potter and the Deathly Hallows: Part 2 film. Like James Potter, Snape, Lupin and Pettigrew, Sirius is portrayed as being much older in the Harry Potter films. Gary Oldman was 46 when he first played Sirius in Prisoner of Azkaban and 53 when he last played him. Sirius died at age 36. In the film adaptation of Harry Potter and the Prisoner of Azkaban, Filius Flitwick's office is replaced by the Dark Tower as a temporary prison. Due to the much bigger fourth book compared to its predecessors, Sirius' role in the film adaptation of Harry Potter and the Goblet of Fire is drastically cut. All of the scenes after his head appears in the fire are removed, and Molly Weasley does not meet him (incidentally, Molly herself is cut from the film). Sirius and Snape only meet on screen in Harry Potter and the Prisoner of Azkaban, directed by Alfonso Cuaron. Their two subsequent meetings in Harry Potter and the Goblet of Fire and Harry Potter and the Order of the Phoenix do not occur. However, they are both heard talking in a meeting of the Order in Harry Potter and the Order of the Phoenix. In the film versions of the series, Sirius has many tattoos, but it is never stated in the book if he has any. These are implied to be prison tattoos that he received while in Azkaban. In Harry Potter and the Prisoner of Azkaban, it is notable that despite the fact that Snape and Lupin know that Sirius was aware of the passageway to the Shrieking Shack and, presumably, were convinced of his guilt, the passageway was not blocked off or guarded. In the film version of Harry Potter and the Order of the Phoenix, Snape's memory shows James disarming Snape, and Sirius remarks, "Nice one, James!" In Battle of the Department of Mysteries, Sirius repeats this line when Harry disarms Lucius Malfoy, calling Harry "James" (these are his last words); a slip of the tongue that does not occur in the book, although it is consistent with comments made in the novel regarding him considering Harry a younger version of James. Also, Harry's middle name is James. In the Order of the Phoenix film, when Sirius arrives with the other members of the Order, he punches Lucius Malfoy exclaiming, "Get away from my godson". This unknowingly causes the destruction of The Prophecy Orb by causing Lucius Malfoy to drop it. Both actions are contrary to the book, in which Neville Longbottom breaks the orb and the punch does not occur. Also, in the film version of the Department of Mysteries battle, Sirius is hit with a Killing Curse by Bellatrix Lestrange which kills him, quite unlike the book, where he falls through the veil, which is what kills him as he had moved beyond it. The names Sirius and Regulus are also names of two main characters in the video game Bomberman 64. Interestingly enough, in Bomberman, Sirius is thought to be a hero when in actuality he is a villain, which is the exact reverse of Sirius Black. In Harry Potter and the Order of the Phoenix, the way Sirius describes his brother's death implies that Regulus was killed by the Killing Curse. But in Harry Potter and the Deathly Hallows, it is established that Regulus was killed by the Inferi in Voldemort's Horcrux cave. However, Sirius states regarding his brother's death "from what I've found out since I got out (of Azkaban)", so it is likely Sirius received this information second hand, so his source may have been mistaken or Sirius may have assumed it was the Killing Curse. There is also a suggestion that Sirius might have done under-age magic. In Harry Potter and the Order of the Phoenix, Sirius states that he ran away from home at age 16. However, in Deathly Hallows, it is revealed that Sirius put permanent sticking charms of the back of all his pictures and posters hanging on his bedroom wall. But, considering he ran away from home at 16, and did not return until about age 35, he would have been under-age at the time he performed the permanent sticking charm. However, since he was in the home of a witch and wizard at the time, this would not have registered. The relationship between Sirius and Mrs. Weasley is considerably more tense in the books than is depicted in the films. He is also depicted in the books as being somewhat less in control than he is shown to be in the Order of the Phoenix film. In the films, after Sirius' death, it seems that Harry has picked up Sirius' fashion sense of occasionally wearing a blazer as regular wear, much like Sirius, who in the Order of the Phoenix film was always depicted as wearing a blazer. Sirius was hysterical when the Aurors lead him to jail because James and Lily's death had unhinged him. Sirius' godson Harry honoured Sirius by naming his first-born James Sirius Potter. Interestingly enough, the child that Harry named after James and Sirius often teases the child whose middle name is Severus, as in Severus Snape. In the film versions, Sirius Black has brown hair instead of black and blue eyes instead of grey. Despite being innocent of murdering Pettigrew and Muggles, a crime for which he was sent to Azkaban, he was not wrongly at Azkaban, per se; being an unregistered Animagus is a crime for which the sentence is, in fact, imprisonment in Azkaban. In the books, Sirius gives Harry an enchanted mirror (by which they should be able to communicate with), however, in the films, this is not shown on-screen. Sirius is described in the books as being able to transform into a dog about the size of a bear. In the movies, however, he transforms into a fairly normal-sized dog. Harry Potter and the Prisoner of Azkaban is the only book in which the narrator calls Sirius by his surname, likely (but not confirmed to be) due to the fact that the novels are portrayed from Harry's perspective and throughout most of the novel, Harry views Sirius Black as a dangerous criminal and later not only this, but also a man who betrayed his parents. He is first referred to as "Sirius" in the narration about halfway through Chapter 20, at which point Harry has learned the truth about him, though at this point the narration is somewhat inconsistent in referring to him as either "Sirius" or "Black". By the final chapter, however, he is referred to consistently in the narration as "Sirius". Sirius was born at autumn, something that possibly relates to the Dog sign of the Chinese Zodiac being associated with that season. "Sirius is very good at spouting bits of excellent personal philosophy, but he does not always live up to them. For instance, he says in "Goblet of Fire" that if you want to know what a man is really like, 'look at how he treats his inferiors, not his equals.' But Sirius loathes Kreacher, the house-elf he has inherited, and treats him with nothing but contempt. Similarly, Sirius claims that nobody is wholly good or wholly evil, and yet the way he acts towards Snape suggests that he cannot conceive of any latent good qualities there...Sirius's great redeeming quality is how much affection he is capable of feeling. He loved James like a brother and he went on to transfer that attachment to Harry." Rowling also described Sirius as a "bit of a loose cannon" and a "case of arrested development" and once described Sirius as "brave, loyal, reckless, embittered and slightly unbalanced by his long stay in Azkaban." ↑ In the F.A.Q. section of J.K. Rowling's Official Site, she stated that Sirius was "around twenty-two" when he was imprisoned in Azkaban. Given that he was imprisoned shortly after 31 October 1981 and attended Hogwarts from 1971 to 1978, Sirius would have been born between 1 September 1959 and November 1959. This page was last edited on 2 July 2015, at 12:39. This text is available under the GNU FDL and may have been adapted from the Wikipedia article about Sirius Black (history).